Emperor, the peace treaties are holding, and your borders are safe - for now. Beyond the edge of the known universe, you've begun to discover exotic worlds full of alien life. What can you gain from these civilizations? What strange new technology can they teach you? This is a time of exploration and learning. 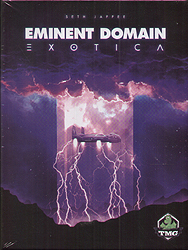 Open your mind to the next chapter in Eminent Domain: Exotica!